The focal point of a full bath is often its tub, which ought to be pristine and gleaming. If yours is pitted, chipped, or scratched—or sporting an old-fashioned color that no longer suits your style—you can spare yourself the bother and expense of ripping it out and replacing it. Options include putting in an acrylic liner for upwards of $300, or learning how to paint a bathtub with a special epoxy. Wait, can you paint a bathtub? You can refresh your ceramic, porcelain, or fiberglass tub’s color and still achieve a high-gloss finish using a specialty kit labeled for tubs and tiles, often available at home centers for about $25. (See this top-rated Rust-Oleum refinishing kit on Amazon, which has been reviewed by more than 2,000 DIY-minded consumers.) Unlike your standard interior paint options, which will crack and peel at the amount of heat and moisture tubs are exposed to daily, epoxy boasts great adhesion and long-lasting durability once cured. 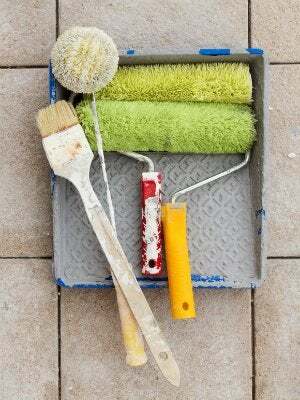 A one-quart kit should be enough to cover the bathtub, but pick up two if you also plan to paint the surrounding tile. Reglazing the bathtub with epoxy can be a bit tricky depending on whether you choose a one-part (pre-mixed) or two-part (ready-to-mix) kit. But with the following steps, patience, and care, you’ll get a porcelain-like finish that will last three to five years. 1. Remove old caulk and the tub’s hardware. Ready the tub: Start by removing the old caulk. (Note: If you don’t have a specific caulk removal tool, a spackling knife or 5-in-1 painter’s tool can sub in here.) Then carefully remove the drain hardware and any fixtures in the bathtub itself, using the correct tools and procedures for your situation. 2. Ventilate the bathroom and clean the tub thoroughly with diluted bleach, scrub cleansers, and acetone. Open the windows and run the bathroom exhaust fan before you begin to clean up any grime, soap scum, and mildew. First, wash the bathtub with 10 percent bleach in water solution. Rinse well, and follow with an abrasive bathroom cleanser like Comet or Soft Scrub. After thoroughly rinsing, wipe a solvent such as acetone (paint thinner would work here, too) over the entire surface to remove any remaining grease or cleanser residue. 3. Repair any imperfections along the tub. Fill any scratches, chips, or gouges with epoxy putty or tub repair product for a like-new surface. Let dry completely and then sand these areas smooth. Next, sand the entire bathtub using wet/dry sandpaper: Do one pass with 400-grit paper and a second with the finer 600-grit. This will rough up the gloss so that paint easily adheres. Rinse the bathtub thoroughly with water and wipe it dry with clean towels or rags. Allow the tub to air dry fully, as it must be free of moisture prior to painting. 4. Mask surrounding tile and any remaining fixtures. When prepping for paint, use painter’s tape to protect the tile at tub level and any fixtures around the bathtub that you could not remove in Step 1. 5. If you purchased two-part epoxy, mix it now. Make sure your room is well ventilated and don your respirator or mask (epoxy paint is really stinky stuff). Then, prep the paint included in the tub refinishing kit according to the manufacturer’s instructions. Many kits use a two-part epoxy paint that you’ll need to combine prior to application. If that’s the case, pour each part into one bucket to mix thoroughly, for at least two minutes. The mixing phase is crucial, so don’t play fast and loose with the directions! Then transfer half of that mixture into the second container to save for the second coat and cover tightly to prevent it from drying out. 6. Paint the tub in two thin coats, leaving adequate time between them for the paint to dry. 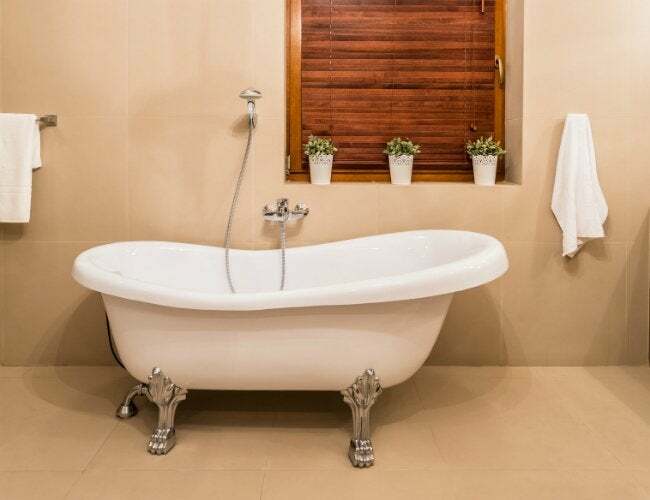 If you know how to paint other surfaces like tile or drywall, you have some idea of how to paint a bathtub. Start at the top in one corner and working your way across and down to the other side. Apply in a thin, even coat, being careful to smooth out any drips as you go with your roller or brush. Epoxy paint has a self-leveling property, so don’t be concerned if you see some bubbles or brush marks—these should disappear as it sets. Allow the first coat to dry according to the manufacturer’s instructions, and apply the second coat in the same way you did the first. 7. Wait at least three days before running water in the newly painted tub. Epoxy takes time to fully cure, so heed the manufacturer’s instructions on drying time. Don’t use the tub until the paint has fully cured—even if it feels dry to the touch, which might be as soon as an hour. Once cured, remove the tape, re-caulk the tub, and re-install the fixtures and drain hardware. Going forward, maintain the bathtub as you would any porcelain surface, with your choice of cleanser. But right now, run yourself a nice, warm bath—you deserve it!